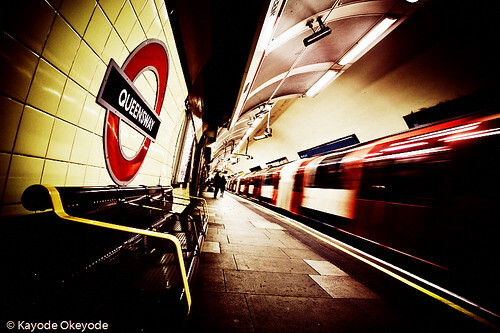 Queensway is a London Underground station. It opened on 30 July 1900, as Queen’s Road, and was renamed on 9 September 1946. The building is an unusual survivor of the buildings designed for the Central London Railway by Harry Bell Measures. 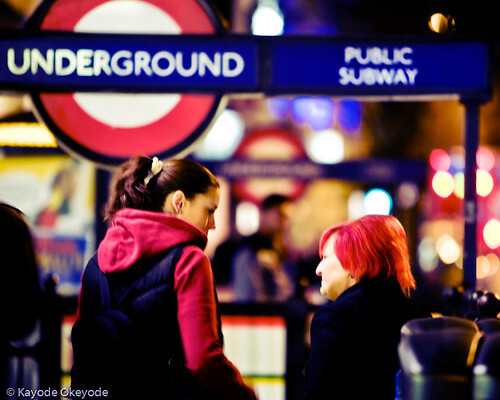 This is a shot of two women parting companies at the Tube Station. There is motion blur because the shutter speed was 1/13 seconds which isn’t fast enough to freeze them (though the out of focus areas are crisp). This was shot at 200mm because I was "training" myself to "see" at that focal length. I didn’t plan to shoot this bridge on Day 58 but I was stuck at work with the Auditors and by the time they were through, I had no strength or inspiration for anything else. This was shot on the way home. One of many pictures I took on Day 55. 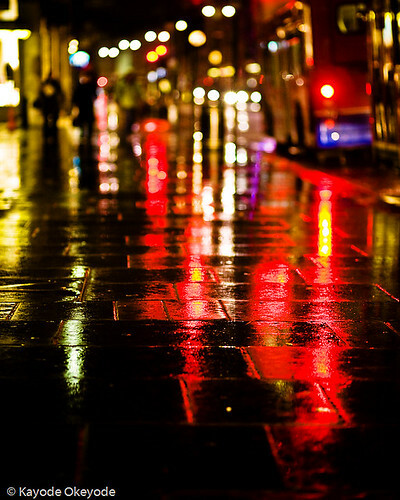 The street is Strand in Central London on a wet night. 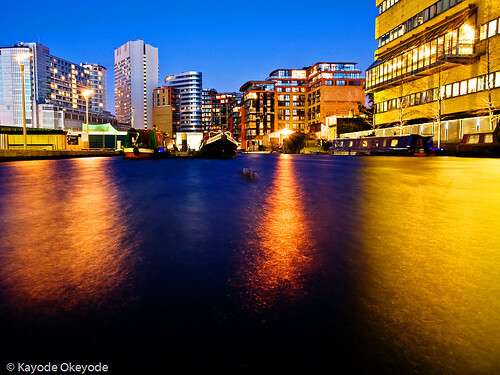 This picture was meant to be taken at twilight but I was late in getting here so this is a night time view of Paddington Basin. It is currently undergoing development and part of the basin has already been drained (not visible here but I went back on day 57 and had a walk around before twilight). 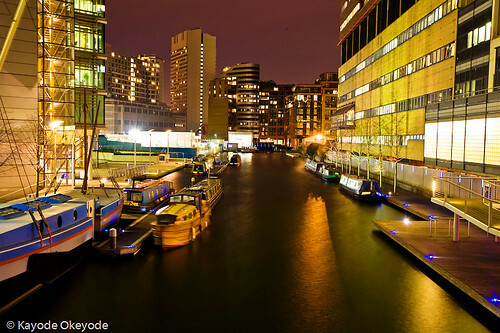 Paddington Basin is an area of London at Paddington named after the nearby canal basin. The junction of the Regent’s Canal and the Grand Junction Canal is close to this point but the basin itself is the terminus of the Paddington Arm of the Grand Junction Canal. It was opened in 1801. Paddington was chosen because of its position on the New Road which led to the east, providing for onward transport. In its heyday, the basin was a major trans-shipment facility, and a hive of activity. 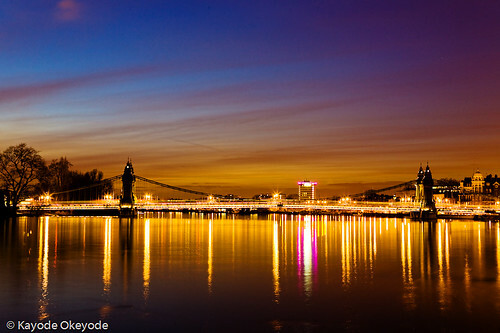 A consortium in partnership with British Waterways began work in January 2000 by draining the basin. The basin is now the centre of a major redevelopment and is surrounded by modern buildings. It is the site of a new rolling bridge, built in 2004. I made a mental note to return to this shot once it stopped raining; but in the three hours that I was in that area, it never stopped and wiping the lens between shots didn’t help . . .
Bush House occupies a dramatic position at the bottom of Kingsway in central London, connected to the Strand on its southern façade. Its particularly impressive portico is flanked by two male statues symbolising Anglo-American friendship, sculpted by the American artist Malvina Hoffman. Over a Celtic altar at the centre of the portico is the inscription ‘Dedicated to the friendship of English-speaking peoples’. The BBC’s foreign language broadcasting service began in 1938 from Broadcasting House in Portland Place. 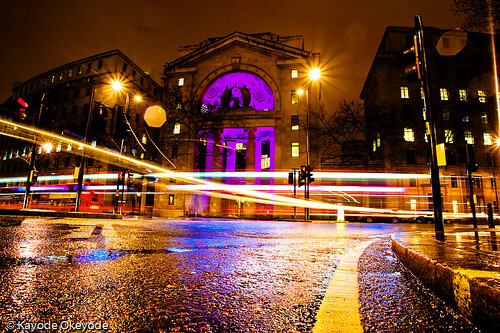 After this building was bombed during the Second World War, the service was re-located to Bush House in 1941. This building in turn suffered bomb damage and the statue representing America lost its left arm. It was restored in 1977.